Green cards through marriage is sometimes referred to as the “fast track” to lawful permanent residence. The spouse of a U.S. citizen is deemed an “immediate relative” under the law meaning that there are no quota restrictions on the number of people who can obtain green cards through marriage to U.S. citizens. The U.S. citizen starts the process by submitting a Form I-130 visa petition on behalf of their foreign-born spouse. If the spouse entered the U.S. lawfully, he/she can file for Adjustment of Status (I-485 packet) without having to leave the U.S.
Generally, the spouse receives an Employment Authorization Document (EAD) within 90 days, and may also be eligible for an Advance Parole document to travel abroad. 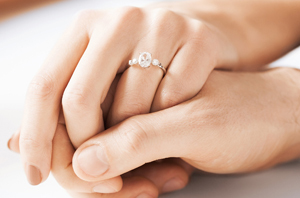 To obtain a green card through marriage, your marriage must be bona fide. Our firm will help put together a strong package demonstrating your marriage is bona fide through documentary evidence. We can also assist you with the green card interview as well as attend if you wish. If the marriage is less than two years old when the green card is granted, it will have a two-year time limit. The couple must submit Form I-751 to lift the conditions during the 90-day prior before the expiration of the green card in order for the foreign-born spouse to obtain a ten-year green card. If the couple divorces before the end of the two-year period, the foreign-born spouse must use Form I-751 to apply for a “good faith marriage waiver” of the joint petition requirement. The marriage green card process is confusing, and trying to figure it out on your own can be time consuming and frustrating. For over 10 years, the Law Offices of Ursula Trimming, Esq. has maintained a 100% approval rating with these types of cases. Our track record speaks for itself. We offer reasonable fees and efficient service. To discuss Marriage Green Cards with an experienced immigration lawyer, please Contact Us today.